On today’s show we return to the Chic-Choc Mountains of Gaspe in the Province of Quebec. (See the show notes from Doing Stuff Outdoors-83 for a detailed description of the area and an account of Gary’s backcountry adventure there this winter) One night they shared a hut with a group of skiers from Montreal. They had alpine touring gear, telemark and one of them used a split-board. Some had been coming to the Chic-Chocs for years. For others this trip was their first taste of eastern powder. That evening in the hut Gary talked to them about backcountry skiing in the Chic-Chocs. Also on the show, comments from Gidds the Outdoor Gal and podsafe music from Blind Alley. Email us with your outdoor adventures, your favorite outdoor books and tell us how the recession is affecting your pursuit of outdoor recreation. I know you’re probably sick and tired of snow and everything to do with winter but I have one more wintery outdoor adventure to share with you. It’s about snow and snow and more snow. It’s about the most snow I’ve ever seen in my life. I experienced it in late February on a week long, hut-to-hut backcountry skiing trip in the Chic-Choc Mountains of Gaspe. I’ve written about this incredibly beautiful and unique area before. This mountain range in the central region of Quebec’s Gaspe Peninsula has 25 peaks with an elevation greater than a kilometer. The highest is Mont Jacques Cartier at 1,268 m (4,160 ft). Caribou graze in the alpine regions and the steep slopes are prone to avalanches. We go there at least once every winter for some of the best backcountry and telemark skiing you can find east of the Rocky Mountains. 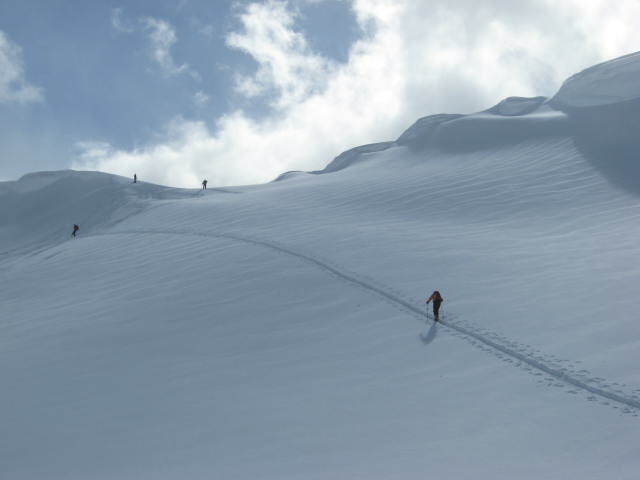 This year when we were there, to our delight, the area surpassed even the west in terms of deep powder. Our trip started at Le Relais Chic-Chocs, a lodge and cabins that in the winter cater mainly to skiers and snowmobilers. We woke up to sunshine and began our ski to the Le Huard hut. With sleeping for 16 it’s the largest hut in the system. There is no running water or electricity but we arrange for a snowmobile to bring in our heavier packs and food so we can ski with a lighter day-pack. That afternoon the nice weather allowed us to ski to the summit of one of the nearby peaks and take in the breathtaking scenery. The run back down to our cabin made the climb up worthwhile. The next day we headed for a two night stay at La Nyctale hut in the shadow of Mount Logan. What started as light snow in the morning soon developed into a full blown blizzard, a common occurrence in the Chic-Chocs. Five hours later we arrived at the hut in near whiteout conditions, after trudging through waist deep snow in some places. Thankful for shelter, we settled in and didn’t leave the hut for the rest of the day. Heavy snow and howling wind continued all night and through the next day but we did venture out to play a little in all that new snow. We found a sheltered slope in the trees not far from the hut and attempted to make a few turns. I say attempted because the snow was so deep we could barely get through it, even on the steeper pitches. One member of our party has been skiing there for the last 15 years and he’s never seen the snow so deep. We sunk to our waists and the powder was truly bottomless. Looking down a tree-well we saw what looked like the base of the trunk 15 to 18 feet below us. That’s how much snow had accumulated so far this winter. When the storm finally ended the next morning we guessed it must have dumped at least 70 more cm of snow. We awoke to a white, winter-wonderland. In the higher elevation where we were, the trees were so coated with ice and snow you couldn’t see any branches. The white shapes they formed are called ‘snow ghosts’ and they look like frozen people. I’ve seen this many times before in alpine areas but never to this extent. It was surreal. We took our time skiing to our final hut, enjoying the incredible scenery and warm sun. We were at a lower elevation and that afternoon the snow had settled enough for us to play on treed mountain behind the hut. We skinned up and skied down through waist deep powder, finishing the run on the frozen lake beside the cabin. The snow was so deep, some of us even skied off the roof of the hut. It was an incredible day at the end of a truly memorable trip. It’s always a great experience in the Chic-Chocs but this winter was special, mainly due to the extreme snow. 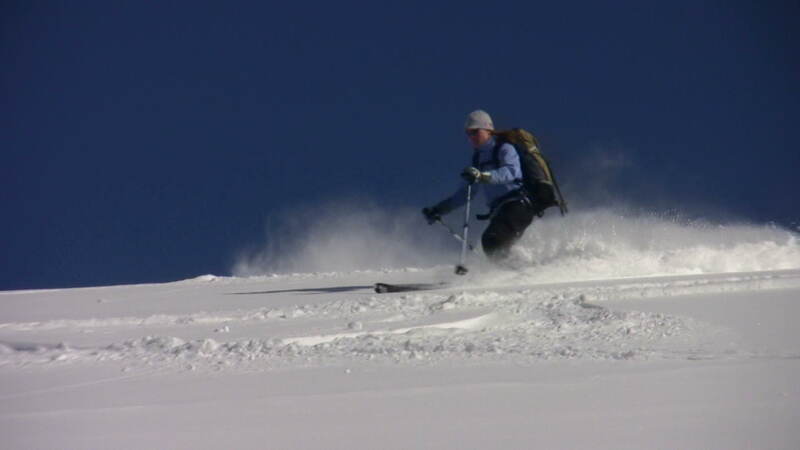 We’re talking about going back in late April for more telemark skiing. 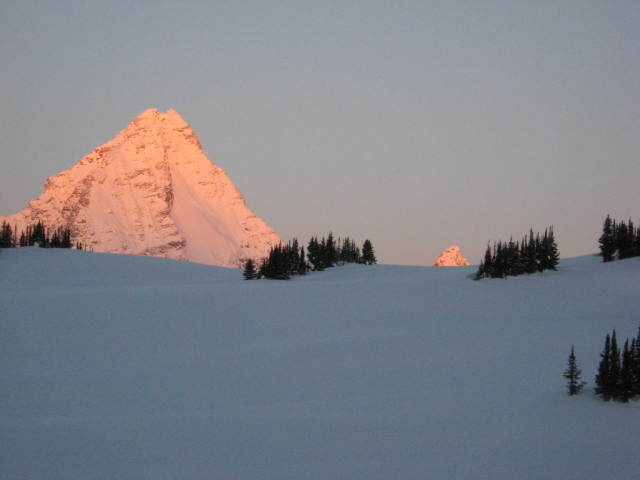 This season I’m sure the snow will be still be deep on those slopes through May and well into June. Also on the show some podsafe music from Jeff Hightower and more of your comments about outdoor adventures and favorite outdoor books including emails from the Wandering Knight and the Canyon Man. We take one last look at skiing and snow on this episode. Gary and a group of his regular gang of backcountry skiers sneak away for a late season weekend of skiing in the Chic Choc Mountains of the Gaspe Peninsula in the province of Quebec. This area and these mountains are a hidden gem. They’re a continuation of the Appalachian Range with the highest peak a little over 4,000 feet in elevation. But these hills have a big mountain feel to them. 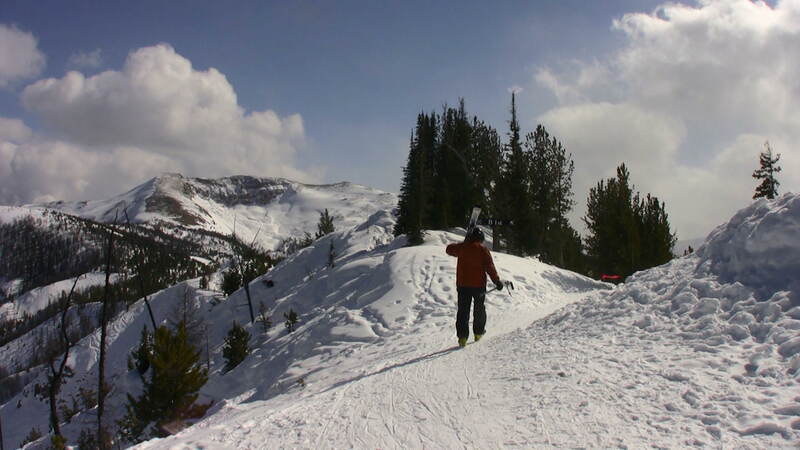 Much of the terrain is above tree line and the area is known for it’s abundant snow and fabulous backcounty skiing and hiking. 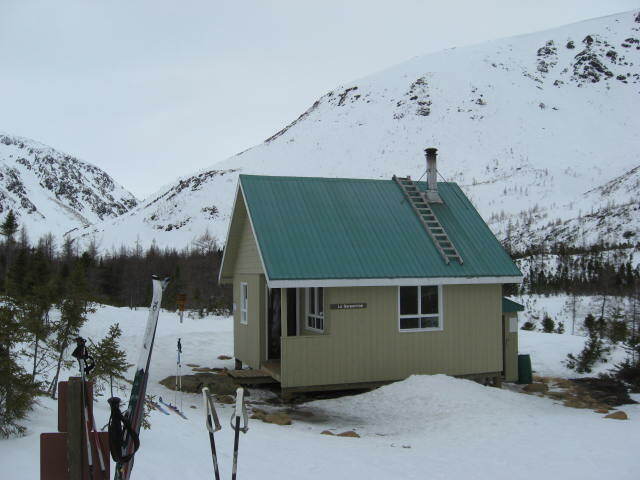 But the secret is getting out, especially the popular hut to hut ski treks. Gary ran into a group of mainly first time Chic Choc skiers from New England. They talk about their adventures in the area and late season skiing, not just in Gaspe but also the legendary Tuckerman Ravine on Mount Washington in New Hampshire. Lone Blagdon has more Trail Magic for us. He picks up his Appalachian Trail adventure at the Nantahala Outdoor Centre in North Carolina where he meets a thru hiker who has to quit the trail and passes on some goodies to Lorne and his daughter. Also in this account… revenge of the chili dogs, dry beans for breakfast, the luxury of a hot shower and beware of falling trees. We’ll also feature some of your feedback including another ‘Where To Get Stuff’ suggestion… Campmor. Podsafe music from the popular Atlantic Canadian band Great Big Sea. If you’d like to recommend your favorite place to get outdoor gear or your favorite trail or place to hike contact us by email at doingstuffoutdoors@yahoo.ca or call our comments line at 206.600.4557. 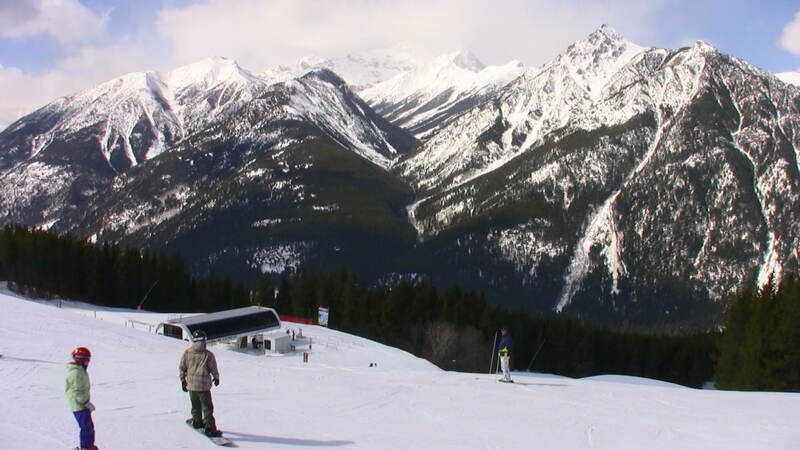 Gary winds up his skiing adventure in British Columbia with a visit to Panorama Mountain Village near Invermere. Panorama is an immense mountain with 4,000 feet of vertical, awe inspiring views everywhere you look, uncrowded slopes and amazing backcountry style skiing right off the lift. 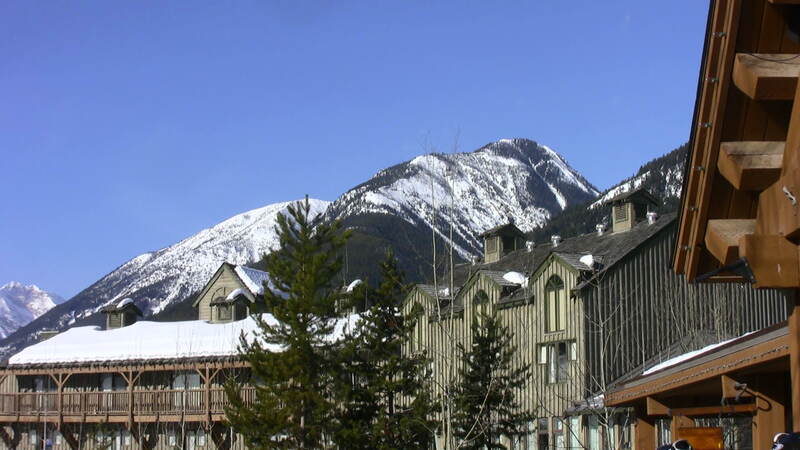 We’ll meet some folks who live year round at the mountain and enjoy that west coast, outdoors lifestyle. We’ll hear about the early days of skiing on the mountain and explore the backcountry opportunities that surround the resort. Skiing is now over for the season at Panorama but the outdoor adventure continues through the summer. Check out the website. Be active… be healthy and enjoy the outdoors. I just got back from an amazing two weeks of skiing in western Canada. Getting there and returning had some challenges but that’s a story for another day. Likewise the experience of skiing at a mountain lodge only accessible by helicopter is another incredible experience worthy of a detailed account. I’ll save that for later too. What I want to tell you about now is that instant during a sunny, blue sky day on a backcountry slope in the Purcell Mountains when the earth moved. I know the avalanche danger has been high this winter in the mountains of western North America. 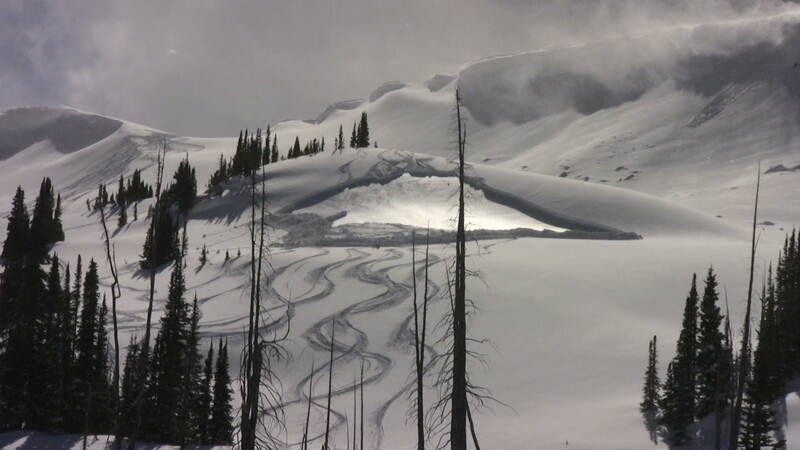 There have been record numbers of slides and deaths because of an unstable snow pack. The first day we arrived by chopper at this luxurious lodge situated in a beautiful alpine meadow, 7,200 feet above sea level, we all received the mandatory instruction in avalanche rescue. We learned how to wear and use the avalanche beacons. We practiced using the device to search for a victim buried under the snow. Our guides showed us the proper way to use the probes to poke through the snow and how to dig out around the buried person using our collapsible snow shovels. We were told how to locate the victims head and work at freeing his breathing passages. 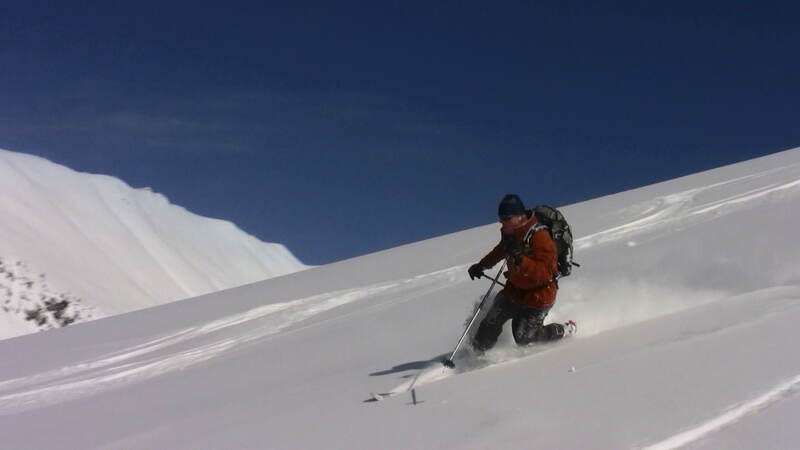 This is the same routine training people receive when they enter the backcountry, either to go heliskiing or like us, attaching skins to our skis and climbing into alpine areas using our own power. Nobody ever thinks they’re going to need the training. That would be a wrong assumption. On our second day at the lodge we headed out early for a full day in the backcountry. The sun burned our faces as we climbed through the trees to a higher elevation. This one particular slope was steep at the top, about a 30 degree pitch, steep enough to avalanche but then it quickly flattened out. That proved to be a good thing. There were six of us in the group and two guides. I skied down last because I was shooting video of the others making turns through the untracked powder. Everyone else had skied down and stopped on a ridge just out of my sight but they could all see me. I put the camera in my pack and started down the slope. My first turn was to the left and I could see two large fracture lines in the snow. I thought to myself that doesn’t look good. As I initiated my next turn something didn’t feel right. I looked down and saw the snow under my skis cracking and swirling. I glanced sideways and saw that I was moving down the slope along with all the snow. I instantly knew I was caught in an avalanche and I got scared. This wasn’t supposed to happen, especially to a maritimer on his first backcountry expedition into the big mountains. Fortunately the slide was short lived. Everything seemed to be moving in slow motion. I can’t remember hearing any sound either. Luckily I was at the edge of the slide and skied off to the side toward some trees. The moving snow covered my downhill ski and tried to pull it down but I managed to shake it loose and ski away. As quickly as the slide had started it ended. Everything was silent and I was fine. I couldn’t see the others down the slope and didn’t know whether to yell for help or just get out of there as quickly as possible. 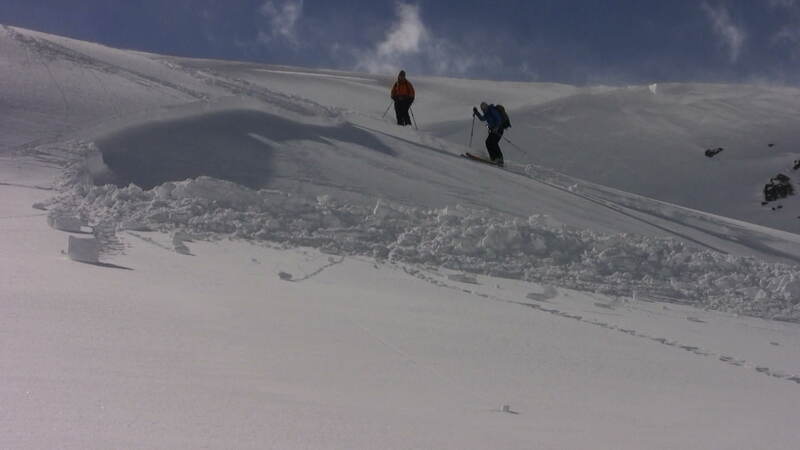 In the end I skied down as fast as I could keeping well away from the avalanche. When I joined the others I realized they had seen the whole thing and were more concerned about my welfare than I probably was. The guides told me I did exactly what I should have done by skiing out of the avalanche. Believe me, it was an easy decision to make. We all went back to examine the slide. 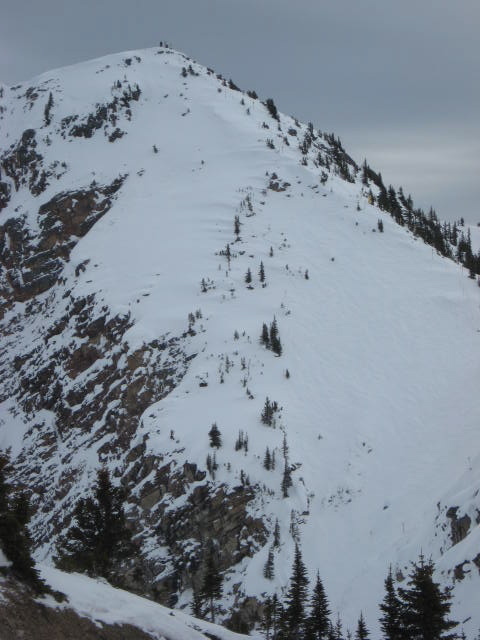 The guides called it a level one slab avalanche caused by a persistent weak layer of snow. They even knew the day it formed back in February. The slope slid for about 60 feet and left a debris pile over a meter high. This was a small avalanche and there was no danger of being buried in it but I could have twisted an ankle or worse if I’d gotten caught up in the mess at the bottom. 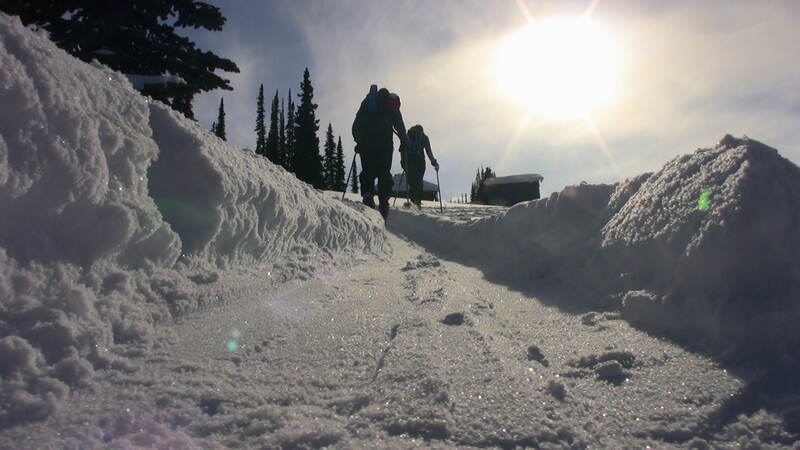 Our guides measured the slide, dug in the snow and took photographs. It was an excellent opportunity for them to study an avalanche close up. Leaving the area we had to traverse across a steep slope with overhanging cornices. We did it one at a time to minimize avalanche exposure. After my experience I was understandably shaken a little and surprised by how quickly I skied across that slope. I think it was the fastest I’d moved all day. That night the guides presented me with a special drink made up of a number of different liquors and topped off with a mountain of whipped cream. They called it appropriately the ‘Avalanche’. I drank and enjoyed it, thankful that I was there and able to. It was a small slide but a gigantic eye opener for me and the others in our party including the guides. 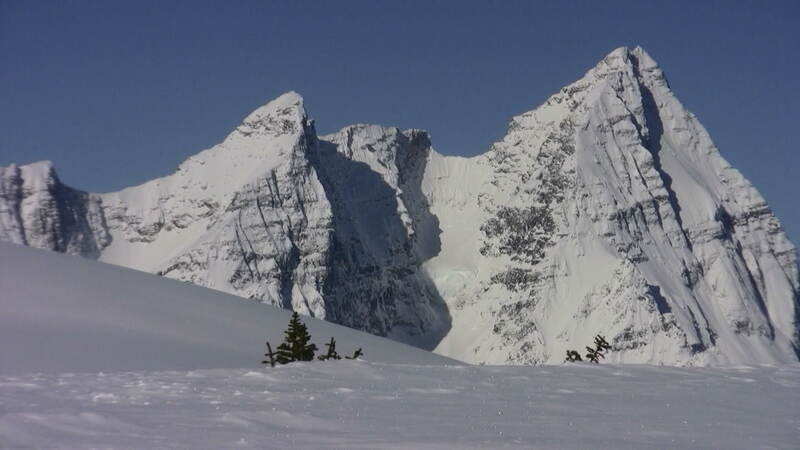 The risk of avalanche is always there in backcountry alpine areas and has to be taken seriously. 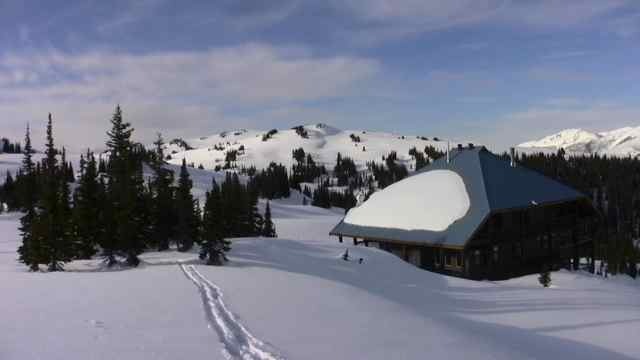 On this special edition of Doing Stuff Outdoors Gary goes to Purcell Mountain Lodge in British Columbia. It’s a slice of heaven nestled in an alpine meadow surrounded by towering summits and tumbling glaciers. This luxurious, wilderness alpine retreat is accessible only by helicopter. It’s a magical place, completely off the grid with its own water treatment plant and power generation from a nearby stream. Only a limited number of visitors are permitted each year. They come for hiking in the summer and the champaign powder in the winter. 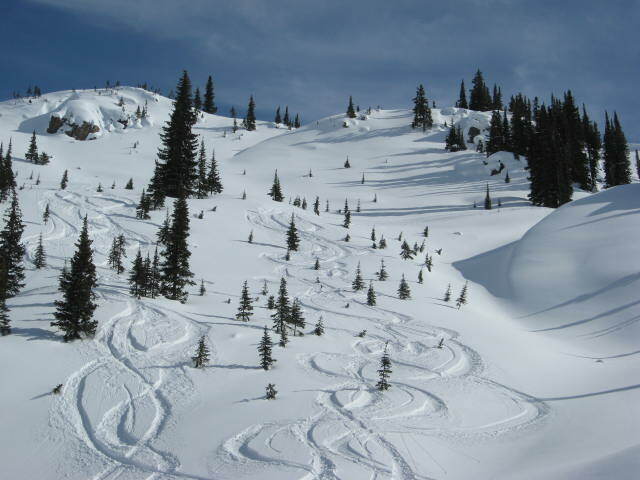 Guests can choose from backcountry touring with skis or snowboards, cross-country skiing, snowshoeing or even tobogganing. It’s a winter wonderland. 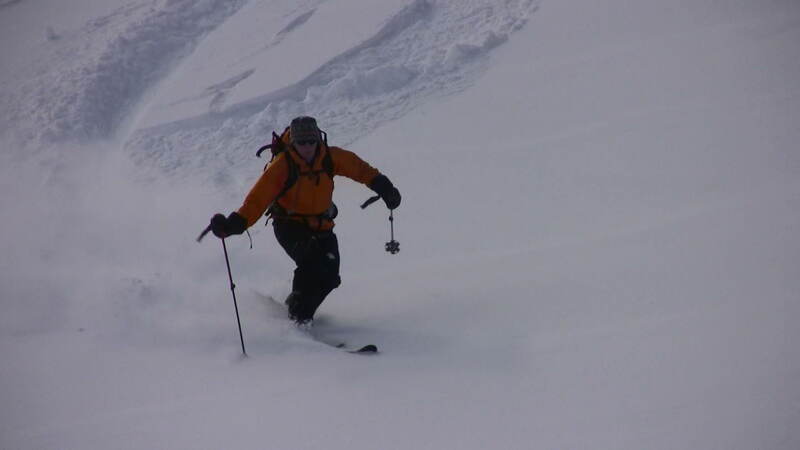 Gary joined five others for a four day telemark backcountry adventure. 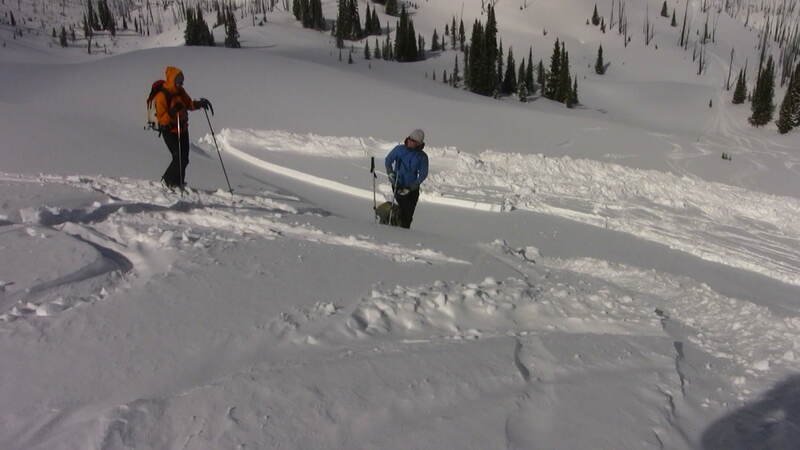 There were plenty of fresh tracks through knee deep powder every day. They experienced 2000-foot descents through treed glades and in alpine bowls. And there were some surprises thrown in as well. Gary recorded an audio diary every day with all the skiers, the two guides and lodge staff. You’ll hear about all the experiences, all the stories and adventures… it’s like being at Purcell Mountain Lodge yourself. Enjoy. 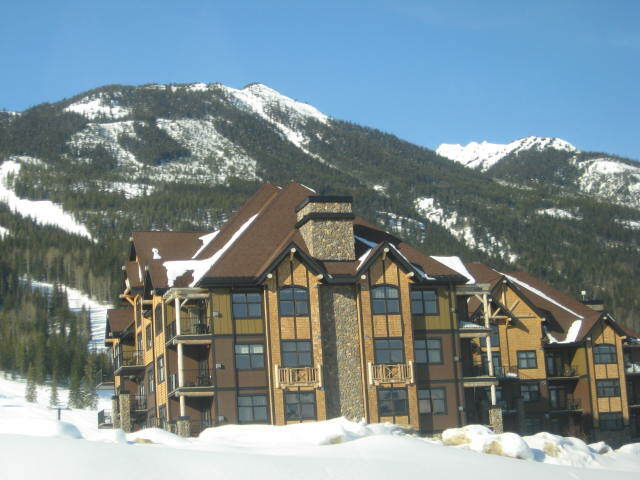 Next week Gary wraps up his BC skiing adventure with a visit to Panorama Mountain Village. Call in your comments, suggestions and outdoor adventures to the comments line at 206-600-4557. Email Gary at doingstuffoutdoors@yahoo.ca and subscribe to DSO in iTunes.